Creates a larger footprint for the saddle tree. Evenly distributes bar pressure, rider’s weight and impact. 2 1/2 inch contour provides wither relief. 30 Day Ride it, Try it, Get it Dirty money back guarantee. Every feature of the CSI Saddle Pad system is designed with your horse’s comfort and performance in mind. The system works with all types of saddles including traditional, flex panel and treeless saddles. At the heart of the CSI system is the revolutionary CSI Flex-Plate. First and foremost, this in-pad plate increases the contact area of the bars. This spreads the pressure of the saddle and the rider’s weight out over a larger surface area which in turn reduces or eliminates pinch and pressure points. (With a treeless saddle, the CSI Flex-Plate actually provides you with a highly flexible weight and pressure distribution system that reduces soreness and fatigue.) But that’s not the only benefit of the CSI Flex-plate — it goes beyond just simple weight distribution and can actually can help your horse achieve a greater range of motion increasing their overall performance level because it works as an orthotic for the horse’s back. The CSI Flex-Plate is made out of a very flexible, high-tensile strength polymer. This material has no memory, it won’t break down or lose it’s protection over time — meaning the outside of your CSI Pad will last a very long time. The CSI Flex-Plate itself is encased in two layers of high impact material with a layer of military-grade shock absorbing foam to provide added comfort and longevity. The layers of the CSI Flex-Plate feature flexible fingers. These fingers correspond to the dynamic areas of your horse’s anatomy and allow for greater freedom of motion by “opening” up when your horse strides. This dynamic response not only allows for better forward motion but also better lateral motion. 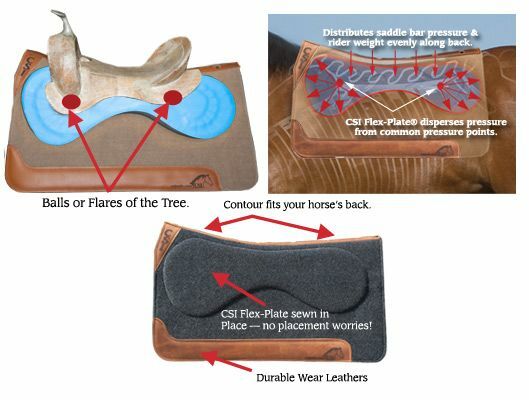 The CSI Flex-Plate is ergonomically designed to work with your horse’s anatomy. The front of the CSI Flex-Plate is larger to offer more protection and improved range of motion for the shoulder of the horse. The foundation of the CSI Flex-Plate is distributed evenly across the horse’s entire top line thus creating an orthotic effect. The result is a horse who is able to move more efficiently with less restriction and more comfort whether riding down the trail, turning back a cow, tracking a steer, turning a barrel, executing a spin in a reining pattern or working all day on the ranch. Supporting the CSI Flex-Plate is a removable and replaceable liner made of 100% All Natural Needled Wool. 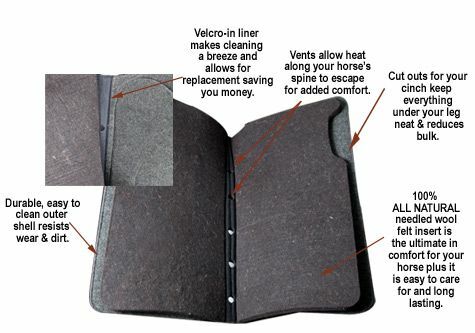 This provides your horse with additional impact absorption as well as a comfort layer between muscle and saddle. The liner is available in 1/2 inch and 3/4 inch thicknesses. What you choose to use in your pad will depend on your horse’s back shape, your saddle fit and the type of riding you do. About 85% of horses and riders will use a 3/4″ liner. On average, a wool CSI liner will last from one to three years depending on care and the amount of use. Most saddle fit experts advise replacement of other wool pads about every eight to twelve months — or more often with heavy use. 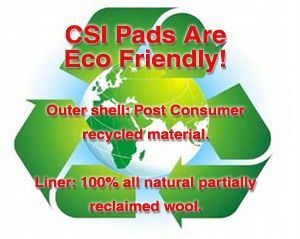 CSI Saddle Pads are eco-friendly. CSI liners are made from partially reclaimed wool which is a green environmental process. The liners are also created using needling and are naturally dyed versus using a chemical process assuring no harsh chemicals or synthetic products can leach into your horse’s body. Needling also helps add loft which acts a shock absorber. CSI liners are reversible, so you can get more use out of one liner. The carpet used to manufacture the outer shell of the CSI Saddle Pad is made from post-consumer recycled water bottles into marine grade automotive carpeting. CSI Saddle Pads is very proud to hand make each and every pad in the USA. We truly believe that the future of our country depends on keeping jobs here on American soil. All CSI Saddle Pads have a 30 day money back ride it and try it (so go get it dirty) guarantee PLUS a five year Flex-Plate warranty. If the Flex-Plate should fail within five years of purchase we will repair or replace your outer shell free of charge. CSI Pads are manufactured by people who ride horses— people who understand the features you need in a saddle pad. Every pad CSI manufactures has a 2 1/2 inch contour. This shape better fits a horse’s back than a square pad. When properly saddled with a CSI Pad, your horse should have complete wither clearance (even high withered horses). In addition, the pad is vented down the spine to allow for heat to escape through the gullet the way your saddle manufacturer intended. All CSI Pads also feature a cut out under the rider’s leg to help prevent against uncomfortable bunching at the cinch and they are manufactured with durable wear leathers to help aid in usability and longevity. (Bonus: our wear leathers are made from American raised cattle!) The outer part of the pad is made from marine grade automotive carpeting making it very long lasting and easy to care for — and the carpet we use is made from post consumer recycled material so, just like our liners, it’s eco-friendly. Although CSI Pads are known for helping high level performance horses and horses with special needs, every horse can benefit from a CSI Pad — horses of every breed, discipline and activity level. So whether you’re a weekend warrior or a professional cowboy; a backyard horseman or a busy trainer a CSI pad will make the difference for you and your horses. We care about each pad that leaves our facility and each customer who receives a pad. If you have any questions, we invite you to contact us at 660.638.4274. The CSI Saddle Pad is unique among all the pads on the market today. What makes the difference is the CSI Flex-Plate. The video below shows our Pressure Challenge demonstration so you can see first hand how the CSI Flex-Plate dispreses pressure versus our competition. We recommend you come see us at a show and experience the difference for yourself! The CSI Flex-Plate stands up to the pressure. 300 plus pounds of pressure is nothing for the CSI Flex-Plate to disperse — we’ll make a hands down bet on that fact — guaranteed! If you haven’t had the opportunity to experience the CSI Flex-Plate difference, visit our booth at upcoming equine expo or show and get prepared to be impressed. You can also visit our FaceBook page (go to the videos) to see some of our customers experience the pressure test first hand. Visit us at an expo or event to take the hands on CSI Pressure Challenge to FEEL exactly how much better our Flex-Plate can disperse pressure compared to our competitors. If you can’t attend a show or expo where we’re going to be soon, then watch this demonstration and read our “What Riders Say” testimonials.